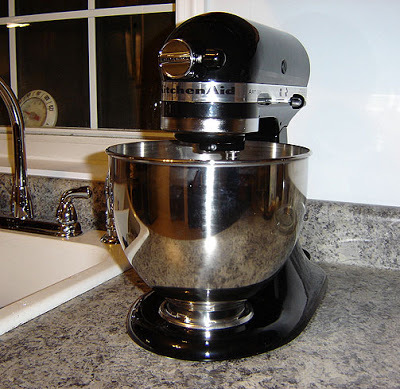 A stand or countertop Mixer is an expensive kitchen appliance. You can easily justify owning one if you cook and bake a great deal and have the kitchen space needed for one. Otherwise you can probably get along fine with a quality hand mixer. It really is one of my favorite things to do. I own several of these wonderful machines, thank goodness! Honey, Buy Me A Stand Mixer! A Hobart machine was used at the restaurant for many years. When it finally needed to be replaced, I bought a KitchenAid. In fact, I bought two 5 quart KitchenAids. (Hobart makes Kitchenaid). They are used every day, several times a day, for a variety of tasks. After four years they are still working fine. 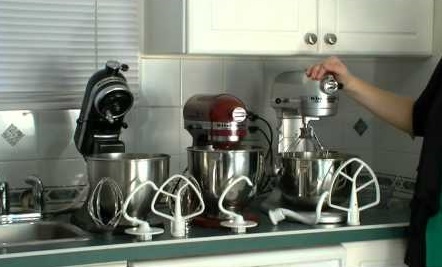 I have another 5 quart KitchenAid at home. I use it for a variety of jobs including kneading dough for bread and cookies (with my granddaughter's "help"). So far I haven't had any problems with the machine. I personally believe KitchenAid has owned this specific market space for home use for years. But I am watching others gaining some ground on the market, specifically Viking. What are the most important things to consider when buying such a machine? You should buy one with at least a 4 1/2 quart bowl. This gives you enough room for making rolls and other breads. Anything smaller means you can probably get by with a hand-held unit. The motor (and its warranty). The manner in which the beater/mixer rotates. It must have a circular motion around the bowl while turning at the same time. Two motions at once. The number or range of speed settings. The over-all size and weight. Remember, these are heavy machines. You don't want to have to move them very often. These machines are made heavy so they don't "walk off" your counter. These stand appliances also have attachments, such as pasta rollers and meat grinders, that expand their usefulness beyond simple mixing. See what comes with the machine you are considering. What does such a kitchen machine cost? Always important! Do I have a specific recommendation? Yes, I will "go out on a limb" based on my experience and research. 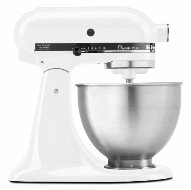 Think seriously about the KitchenAid KSM150PSER Artisan Series 5-Quart pictured here. Thank you for visiting! Thanks for your interest in cooking and cookware! Did you know? In 1908 Herbert Johnson, an engineer for the Hobart Manufacturing Company, invented an electric standing machine for mixing. His inspiration came from observing a baker mixing bread dough with a metal spoon; soon he was toying with a mechanical counterpart. By 1915, his 20 gallon (80 l) machine was standard equipment for most large bakeries. In 1919, Hobart introduced the Kitchen Aid Food Preparer (countertop) for the home.